Let's familiarize ourselves with the Spring RCP. New life seems to have been blowing into this project: after almost two years of hiatus, the 1.0.0 release came out a few months ago. Let's leave aside the question about its direction and so on and, instead, let's look purely at the technology itself to see exactly what it offers. In that light, I've made available a simple plugin for NetBeans IDE that provides samples and templates to get things started. Below, I walk through a basic scenario using the plugin. 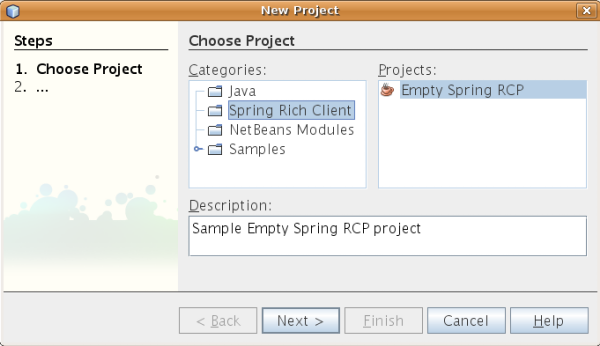 However, even those who are not NetBeans users could learn a lot about Spring RCP by reading the steps in this tutorial and the explanations that accompany them. 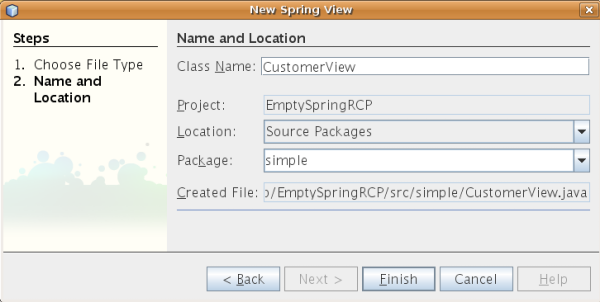 Install the Spring RCP Tooling plugin into NetBeans IDE 6.1.
application context XML file and the startup context XML file, where application-level concerns such as the splash screen, initialization sequences, and views are defined. richclient-startup-context.xml Provides the startup context XML file, which defines the splash screen, but could define anything that you want to have happen specifically at startup. commands-context.xml Provides the application's commands, organized within menu bars and toolbars, and the items within them. This file is declared in the application context XML file. 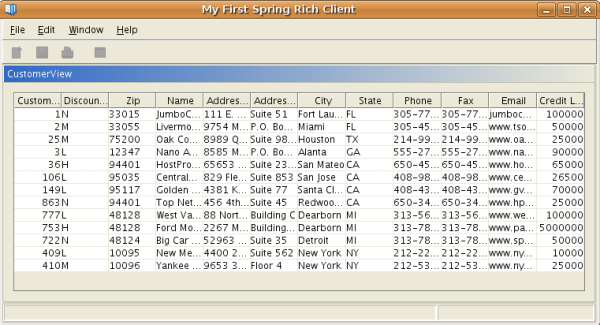 messages.properties Provides the display texts in a centralized location. For example, texts for titles and descriptions are found here. 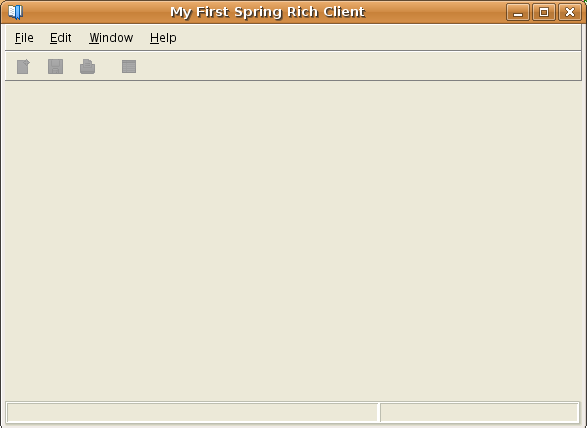 Note: The template also put most of the Spring RCP JARs on your application's classpath. Look in the Libraries node to see which ones are there. Potentially, more JARs could be included in the plugin as the complexity of the provided tooling increases. Now we will create a new window in our application. 6 . 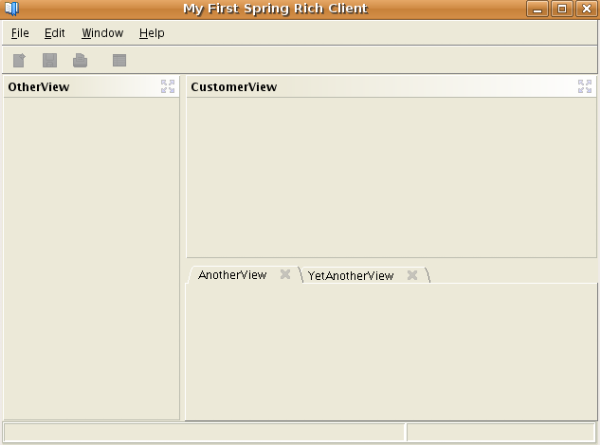 Run the application again and notice that the Customer View now appears when the application starts. 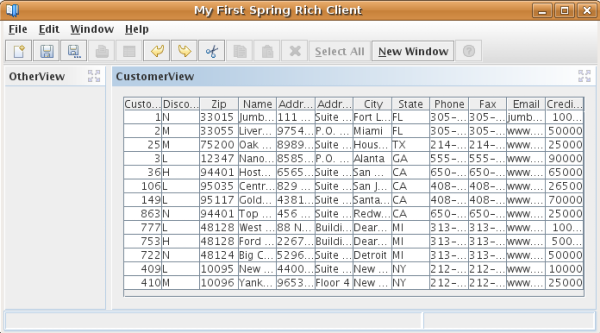 Next, we'll use our new Spring View to display customer data to our users. Nothing in this section is specific to Spring RCP. Nothing more than its seamless integration with standard Swing development is demonstrated below, together with the related benefit of being able to use the associated development tools provided by NetBeans IDE. 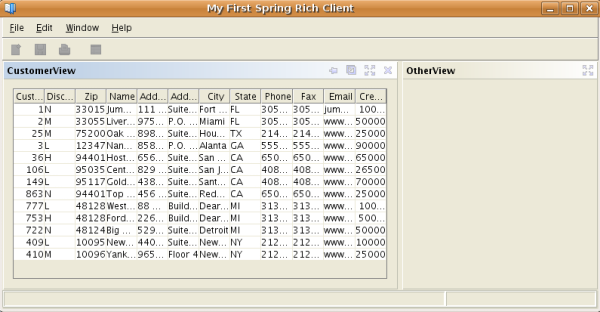 We'll use one of the databases bundled with the IDE, but we could be using any database at all. Right-click the project node and choose New | JPanel Form. Name the panel "CustomerPanel" and choose "simple" in the package drop-down so that your panel will be created in the same package as where the other classes are found. Click Finish. Now, whenever you run the application, the CustomerPanel will define the initial view. Open the Services window (Ctrl-5). 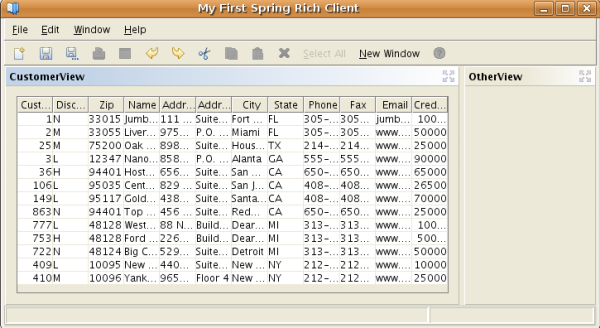 In the Services window, expand the Databases node, right-click the jdbc:derby node, and choose Connect. The IDE now connects to its bundled Derby database. 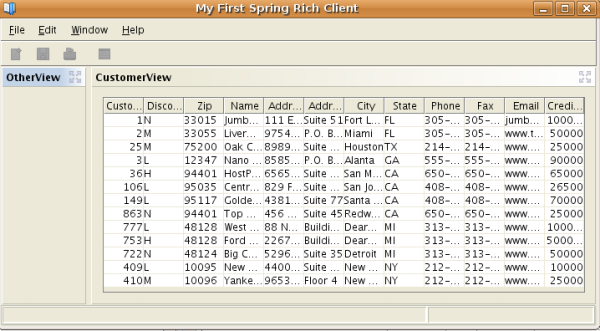 Expand the jdbc:derby node, expand the Tables node, and notice that there is a table called "CUSTOMER". That's the table we'll show in our application. Note: Make sure that you click the two arrow buttons on the top right of the screenshot above. Doing that will result in the JTable resizing automatically at runtime, to fit snugly into the size of the JPanel. The related JAR files should automatically be added to your project. If they're not and you see a lot of error messages in the generated code, right-click the Libraries node, choose Add Library, and then add "Beans Binding" and "TopLink Essentials", as well as "derbyclient.jar" from your JDK's db/lib folder. At the moment, we only have one view (i.e., one window). One of the central reasons for desktop developers choosing to use an RCP is the need for a windowing system. As soon as a desktop application starts becoming non-trivial, you need to be able to deal with multiple windows. More than simply showing multiple windows, you also need to provide functionality for maximizing and minimizing them, for opening and closing them, for docking and undocking them. Not much fun to code all of that. Let's see how Spring RCP can help us with this basic requirement. First, we need to add a new view, so that we have two windows. 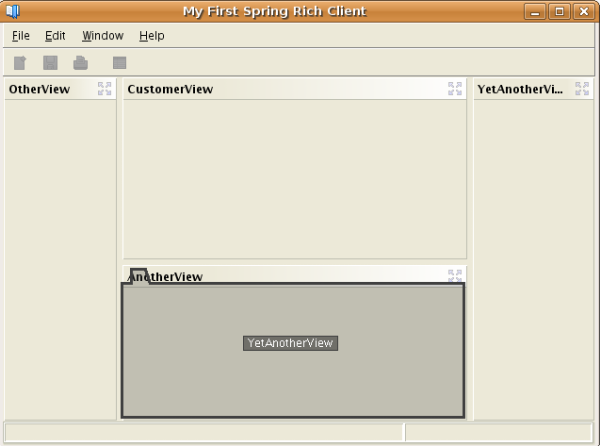 Use the Spring View template, as described earlier in this tutorial, and add a new view with whatever name you like, in the same package as before (or anywhere else). 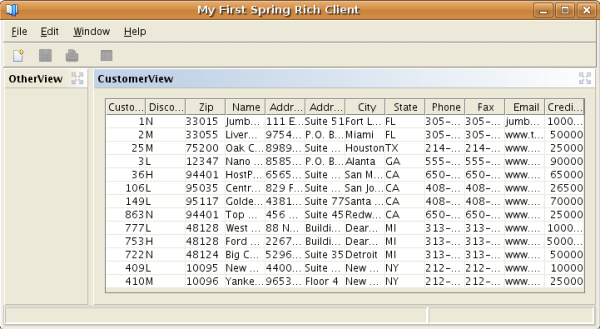 As before, the view is registered for you in the richclient-application-context.xml file, as well as in the messages.properties file. When you run the application, you'll have two menu items under Window | Show View. On selection, the second view replaces the first view, and vice versa. That's not docking, that's replacing. So let's now change that so that both are displayed at the same time, i.e., so that both windows dock within the Spring RCP. 7. You can do the same for the other view, depending on which of the properties above you would like to make available to that particular window. The names of the above properties are self explanatory, except for "autoHideEnabled", which will add minimize functionality to your view. Note: To be able to drag a detached window, your cursor needs to become a hand, which is what happens when you move the mouse over the dotted line at the top of the window's title bar. Note: One thing I haven't been able to figure out is how to save window positions at shutdown. In other words, at startup the user would like to have the window positions be restored to where they were when the application last closed. I don't know how this is handled in Spring RCP. I believe it should be done automatically, which doesn't seem to be the case since the application reverts to its default state when I rerun it. Let's now look at the menubar. Several menu items are available by default. Where do they come from? Our simple application contains no Java classes that have anything to do with menu items. So, what's going on here? 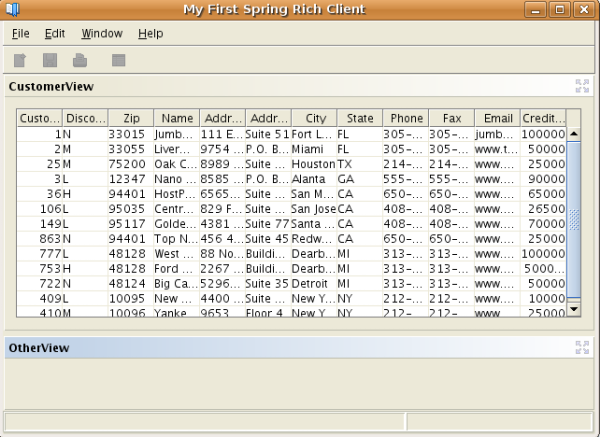 Menus and toolbars are all declared in the "command-context.xml" file. That file and its contents, in turn, are declared in the "richclient-application-context.xml" file, which is the application context XML file that is loaded at startup. Note: The menubar and the toolbar are also declared above and are then further spelled out in the "command-context.xml" file. So, the "Help Contents" item is disabled, while the "About" item is enabled. Why? Note: We refer above to "help/simple-hs.xml". 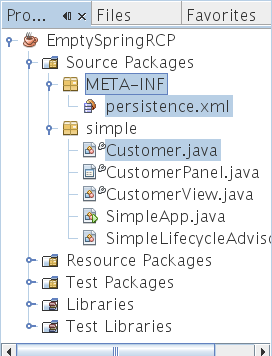 That's the JavaHelp helpset file that is the entrypoint to our helpset. You could create that by hand, as well as all the files that are needed to set up a JavaHelp helpset. 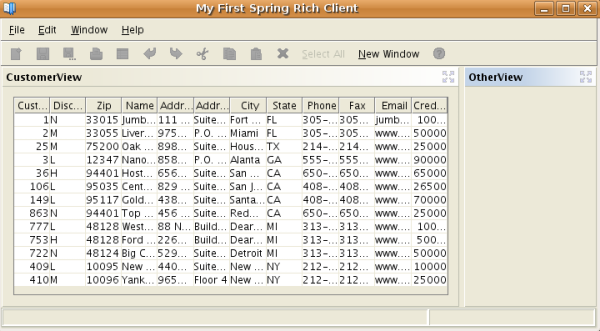 Instead of that, save yourself some time and trouble by going back to the New Project wizard (Ctrl-Shift-N) and in the "Samples" category you will find some Spring Rich Client samples. Complete the wizard for one of them and then copy its "help" package into the "Resource Packages" node of your own application. Hurray you now have the start of your own helpset. 6. Run the application and now the "Help Contents" item is enabled. When you click the item, the JavaHelp from the sample appears. As your application increases in size, fewer actions remain relevant to all views. Not every menu item should be available to every window, for example. This aspect of large applications is referred to as "context sensitivity" or "selection management". Depending on the current context, certain features should be available while other features are hidden or greyed out or disabled. * Handler for the "New" action. * to making the view visible. * Private inner class to create a new customer. Reference is made here to "newCommand". Where's that defined? 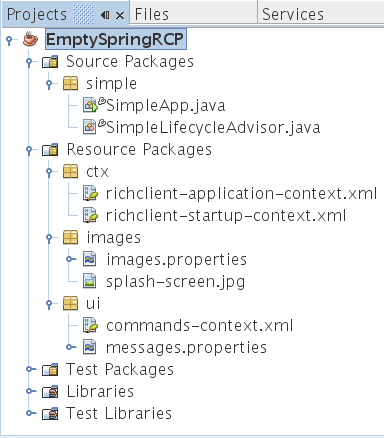 As always, all commands in Spring RCP are defined in "command-context.xml" file. There, note that the "windowCommandManager" bean declares "newCommand", among other commands, under "sharedCommandIds". 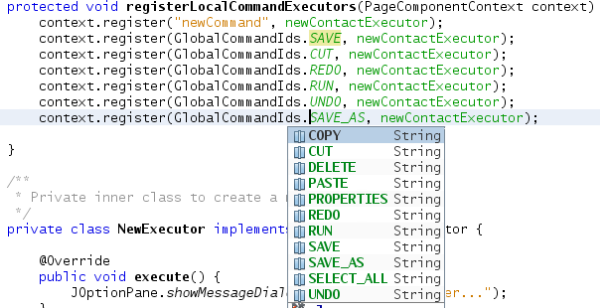 In each view, a different target executor could be defined for the same command. 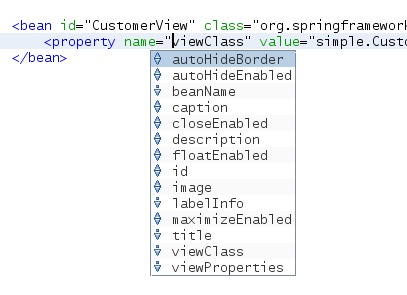 In the code above, an "ActionCommandExecutor" is defined in the CustomerView, which produces a JOptionPane with a message as a placeholder for real code. In the OtherView, there could be a different way of handling the "newCommand". In other words, though the "newCommand" is globally visible, it is implemented differently per view. There are several other topics that could be discussed in the context of Spring RCP. However, the topics discussed so far should serve as a pretty good basis and give you an understanding of what Spring RCP can do for you and how various pieces fit together. At this point, you certainly should have enough information to build some pretty solid applications on top of Spring RCP. 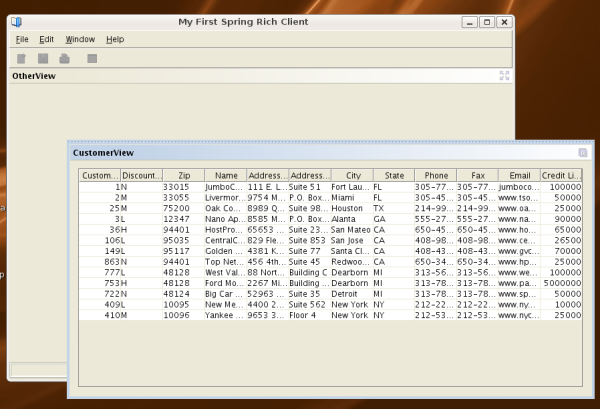 It is tempting to attempt to compare Spring RCP with similar offerings in the desktop framework domain. It is also tempting to make value judgements. However, that's not the purpose of this article and will be broached at another point in time. I think that that is viable to visit this site, just because here only we should find the perfect information related to this topic. Thence, the <a href="http://www.master-dissertations.com">thesis</a> service can take it for doctoral thesis making. I really would like to to thank you a lot for your hot facts close to this post. I opine that you require the help of a master submit article service or some manual article submission to do your topic impelling. I opine that to receive the business loans from banks you ought to have a firm motivation. However, once I have got a college loan, just because I wanted to buy a building. Looking forward for more share coming from you. Thank you so much for the share! I am big fan of guitar. 你那是 IDE, 通常跑得 RCP Application 不至于. Please share you views here. this is wonderful article. this is so good in title as well. its going good and having so many useful things. I really needed to buy a building for my corporation but I didn't earn enough money and could not order anything.